I’ve generally enjoyed most Fuggles & Warlock beers, but I have to admit I’m really partial to their IPA releases which are always great. Located in Richmond, BC with a super cool taproom near the Massey Tunnel at Highway 99, it’s almost too convenient of a stop on the way home from Vancouver or when driving to and from the airport, or Tuesday, or let’s face it any day of the week really! 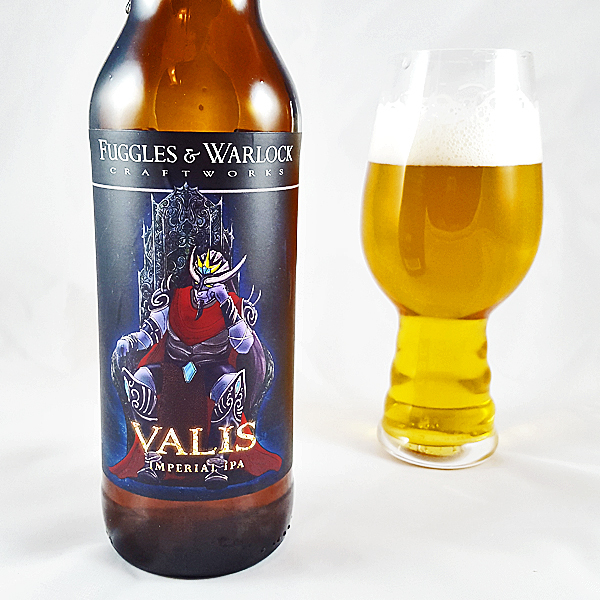 I got a preview of the this release at someone’s 5000th beer celebration so I knew it was going to be something worth picking up and they once again delivered another excellent, palate smacking concoction in their Valis Imperial IPA which was released almost a week prior to this post. Aroma and Appearance: It pours a clear golden colour with some medium paced bubbles and two fingers of white lacy foam. The aroma shows off some sweet caramel fragrance, mixed with oranges, wood resin, floral overtones and a unique cross between medicinal weed and sweet pipe smoke. Flavour: Valis starts off with an impressionable sweet caramel malt base that’s very doughy with some floral hop notes that sneak in and stave off some of the initial sweetness before it moves into an Earl Grey tea and nettle focused, medium bodied chewy middle. At the end it transitions into a massive wood resin finish that lingers on and on before bold flavours of pipe weed slide into in the back of your throat and dominate the aftertaste. Overall Impression: Impressionable flavours with a good sense of overall balance and I found the pipe smoke resemblance to be very, very intriguing. Rating: I gave it an excellent rating of 8.5/10, very good value for money and great fresh! Food Pairing: I think this might work well with a spicy tuna roll type sushi selection, some sharp cheddar or pulled pork. And now for something completely different…they have another sour release that just launched in the taproom today. I have to get back there and get some bottles. This was seriously good on tap!